Is The Great Deformation the right book for you? Seriously! It’s not exactly an optimistic outlook on the state of our financial system. 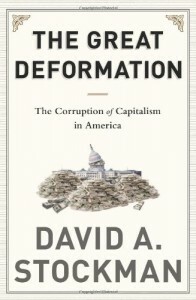 But it’s a fascinating read, and in this book review of The Great Deformation, I’ll be happy to share with you what you should expect when reading this book. And boy, was it ever illuminating. Now let me tell you a little more about this New York Times best seller. The Great Deformation is a really eye-opening book, because it challenges the narrative of financial history in a very compelling way. It takes a critical look at the 2008 financial crisis (or, as Stockman calls it, the Blackberry panic). He shows why the reaction was unjustified and reveals the allegedly nefarious motives of the main players. It’s a really revealing analysis of policy decisions that influence us all, whether you agree with his conclusions or not. First, the book starts by reviewing the 2008 financial crisis, criticizing the actions of society’s most-powerful plutocrats and policymakers. Next, Stockman takes a step back to look at how US government and business policies have evolved over the last 75 years. He clearly and compellingly shows that it’s no accident we are where we are today. And his prognosis for the future isn’t exactly rosy either. Plus, David Stockman has the experience to back up his claims. His extensive work at power positions within both government and in the private sector make him uniquely positioned to offer insight on the evolution of America’s financial and monetary policies. It’s an unpopular viewpoint, but one that’s worth learning about, if only to hear a narrative you won’t find in the mainstream media. So what was my favourite part about The Great Deformation? To me, the really amazing aspect of The Great Deformation is the way that Stockman doesn’t hold back. He leaves no stone unturned and no punches barred. The book is about 800 pages, but rather than a marathon, it reads like a sprint. The pace at which Stockman makes proclamations and predictions is truly astounding. Despite being a veritable tome of information, The Great Deformation reads quickly. It’s an engaging series of stories that will leave you scratching your head, at the very least. Stockman’s passion for the financial and political policies shaping our current and future situation is truly unbridled. It’s impressive to see someone lay out such a detailed description of our past and current circumstances, and what they presumably imply for the future. So although I quite liked The Great Deformation, there’s still one area that I think could be improved upon. As I said, The Great Deformation does a wonderful job identifying and enumerating the myriad issues that plague our society. Stockman is incredibly critical of the policies and decision-making that have led us to our current situation. While pointing fingers and laying blame can be appropriate and interesting, it’s not exactly inspiring. Stockman offers a couple of potential solutions to the issues at hand, but by-and-large, he is focused on pointing out what’s wrong. To me, the book would have made more of an impact if Stockman offered some more suggestions on how to ameliorate the current situation, rather than just criticize it. On the other hand, it seems Stockman believes The Great Deformation is still underway and there’s very little to be done to improve things, without a wholesale changing of the old guard and the principles we take for granted in our capitalistic society. I guess a problem well-defined is one that’s half-solved. So my regards to the author for taking it that far. I appreciate there aren’t easy solutions. Now, let’s wrap up this book review of The Great Deformation. 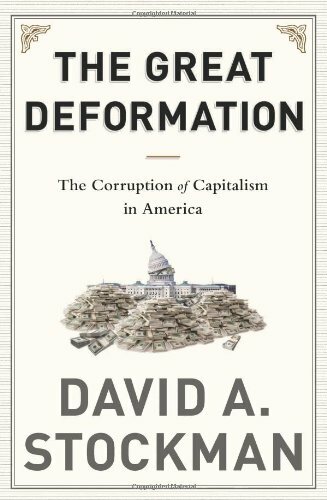 The Great Deformation is an eye-opening and incredibly informative book about the systemic problems that plague our financial system. The author does an impressive job highlighting the implications for businesses and individuals alike. And the mountain of statistics, anecdotes and information is enough to convince even the most ardent optimists that all is not what it seems. If you’re curious to learn a little more about The Great Deformation, I encourage you to watch the video book review below. You can also click through to buy the The Great Deformation on Amazon. So what are you waiting for, why not read The Great Deformation for yourself? This entry was posted in Stock Ideas and tagged investment book reviews on March 21, 2015 by Jworthy.